For the 2014 film, see The Admiral: Roaring Currents. Half of the Japanese soldiers dead or wounded. In the Battle of Myeongnyang, on October 26, 1597, the Korean Joseon kingdom's navy, led by Admiral Yi Sun-sin, fought the Japanese navy in the Myeongnyang Strait, near Jindo Island, off the southwest corner of the Korean peninsula. With only 13 ships remaining from Admiral Won Gyun's disastrous defeat at the Battle of Chilchonryang, Admiral Yi held the strait as a "last stand" battle against the Japanese Navy, who were sailing to support their land army's advance towards the Joseon capital of Hanyang (modern-day Seoul). The actual numeric strength of the Japanese fleet that Admiral Yi fought is unclear; various sources indicate the number of Japanese ships could have been anywhere between 120 and 330 ships, though the low end of this range appears to be a count of actual warships and the high end appears to be referring to the entire Japanese fleet (including roughly 200 supporting non-combatant ships). :312 Regardless of the size of the Japanese fleet, all sources indicate that the Japanese ships heavily outnumbered the Korean ships, by at least a ten-to-one ratio. :302 In total 30 Japanese warships were sunk or crippled during the battle. Tōdō Takatora, the commander of the Japanese navy, was wounded during the battle and half of his subordinate officers were also wounded or killed. 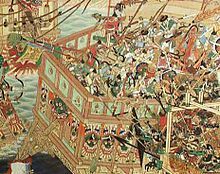 Given the disparity in numbers of ships, the naval battle is regarded as one of Admiral Yi's most remarkable victories, and a humiliating naval defeat for the Japanese. Even after the victory, however, the Joseon navy was still outnumbered by the remaining Japanese navy, so Admiral Yi withdrew to the Yellow Sea to resupply his fleet and have more space for a mobile defense. After the Korean navy withdrew, the Japanese navy made an incursion into the western coast of Korea, near some islands in Yeonggwang County. With the Joseon navy taken out of the scene, the Japanese believed that they now had free access to the Yellow Sea and could resupply their troops through this sea route as they advanced northward. Five years earlier, in the 1592 campaigns, Admiral Yi prevented the Japanese from resupplying their troops in this manner and kept their ships holed up at their main bases in Busan harbor. The Japanese had started the second war and renewed their offensive, laying siege and capturing the city of Namwon in September 26 and fighting the Ming Chinese army to a standstill in Jiksan on September 7.:478 The Japanese army then awaited supplies and reinforcements from their navy, who would need to enter the Yellow Sea to reach the western coast of Korea. The army, thus supported by their navy, planned to make a major push to recapture Hanyang (modern Seoul). At that time, King Seonjo, who judged that the Joseon navy had lost its power and would never be restored again, sent a letter to disband the navy and have its men join the ground forces under General Kwon Yul. Admiral Yi responded with his own letter, stating: "Even though our navy is small, as long as I live the enemy cannot despise us." Admiral Yi studied numerous sites for his last stand with the Japanese navy and decided on luring them into the Myeongryang Strait. The Japanese would clearly enter the strait when the tide was favorable; thus, he didn't want to fight south of the strait, with the current at the attacker's advantage. :311 Instead he wanted to fight in the waters just north of the strait, where the currents were calmer. The strait had very strong currents that flowed at approximately 10 knots, first in one direction, then in the opposite direction, in three hour intervals. Admiral Yi realized he could use this unique condition as a force multiplier. The narrowness of the strait would prevent the Joseon fleet from being flanked by the numerically superior enemy fleet, and the roughness of the currents prevented the Japanese from effectively maneuvering, forcing them to attack in smaller groups, and made it difficult to close in with the Korean ships. Furthermore, once the tide changed the flow of the current would in effect push the Japanese away from Yi's fleet and the momentum could be harnessed to increase the effectiveness of a counterattack. Early in the morning of October 26, the huge Japanese fleet was spotted by Yi's scouts as they deployed around the small bay on the southern end of Myeongnyang strait. Admiral Yi's fleet then redeployed out of their base in Usuyeong to block the northern end of the strait. Yi described about "...200 enemy ships... flowing [into the strait]" and at least 133 ships in his immediate vicinity. :312 It is estimated that at least 133 ships were combat warships and that some 200 ships immediately behind were logistical (supply and troop carrying) support ships. In Japanese records, the ships at the front of their formations were the middle class warships called Seki-bune, as the Japanese fleets by this time understood the devastating offensive capabilities of the main Korean warships which were near the strait. Yi's warships deployed on the northern end of the strait and dropped anchor. Yi in his flagship advanced upon the vanguard of the Japanese fleet, which was commanded by Kurushima Michifusa. For a time only the flagship fought in the battle. The crews of the Joseon fleet were made up of survivors from Chilchonryang and they were still badly shaken up and intimidated by the overwhelming size of the Japanese fleet. Yi said in his diary: "My flagship was alone facing the enemy formation. Only my ship fired cannons and arrows. None of the other ships advanced, so I could not assure our outcome. All other officers were seeking to run, as they knew this battle was against a massive force. Ship commanded by Kim Eok-chu, the Officer of Jeolla Right province, was at 1 majang (approximately 2–3 km) away. ":312 For a time it looked like Yi's flagship was "... standing like a castle in the middle of the sea." The flagship's ability to hold out against the Japanese vanguard eventually gave heart to the rest of Yi's fleet and small groups of his ships came to his aid. First came a ship commanded by local magistrate An Wi and then several ships commanded by central squadron leader Kim Ung-ham. Seeing the success of the flagship and the handful of other boats, the rest of Yi's fleet joined in the fight. The tide soon shifted and the Japanese ships began to drift backwards and collide with each other. In the confusion, Admiral Yi ordered his ships to advance and press the attack, ramming 30 Japanese ships. The dense formation of Japanese ships crowded in the narrow strait made a perfect target for Joseon cannon fire. The strong tides prevented those in the water from swimming to shore, and many Japanese sailors who abandoned sinking or damaged ships drowned in the currents. By the end of the battle, approximately 30 Japanese warships were sunk. Some Korean documents record the number of damaged Japanese warships, which also includes those not sunk but sustaining some amount of damage; however, the condition of the damaged ships is unclear. "御歸陣被成候 ちとまへかとにこもかいへ御こしなされ候 処にすいえんと申所にはん舟の大しやう分十三そうい申候 大川のせよりはやきしはのさし引御さ候 所の內にちとしほのやハらき申候 所に十三そうのふねい申候 それを見付是ともとり可よし舟手と御相にてはいまのせとをこきくたし候 儀はなるましきとていつれもせきふねを御かゝり被成 さき手のふねともハ敵船にあひ手負あまたいてき申候 中にも來島出雲守殿うちしににて御座候 其外ふね手の重めしつれられ候 からうのもの共もくわはん手負討死仕候 処に 毛利民部大夫殿せき舟にて、はんふねへ御かゝり成候。 はん船へ十文字のかまを御かけ候処に、 はん船より弓鉄砲はけしくうち申候に付、 船をはなれ海へ御はいりなされ、あやうく候 処に、藤堂孫八郎、藤堂勘解由両人船をよせ、敵船をおいのけ、たすけ申候。 朝の五しふんより酉の刻まて御合戰にて御座候 みなとのやうすはん船能存候に付風を能見すまし 其せと口をめけほをひきかけはしらせ申について是非なくおつかけ申儀もまかいならす いつみ樣も手を二か所おはせられ候." "We came back to the camp. There were 13 Joseon ships in the sea. It is the whirlwind sea, but 13 ships stood there while it had calmed. We decided to fight with them. The width of the sea is too narrow so that we prepared Sekibune and started the battle. Starting the battle, lots of our people got wounded. And sir Kurushima Michifusa was killed. Also, lots of our people got captured. Half of my subordinates officers were wounded or killed. Mori attacked the enemy's ship riding on a Sekibune. To get aboard to the enemy's ship, we threw sickles. But the enemy shot the arrows and bullets fiercely, so he got endangered. Tōdō Songhachiro, Tōdō Kanggaiu's ships pushed the enemy's ship and saved him. We fought from morning till night. We ran out of the narrow sea hoisting a sail. Because of that fact, the enemy's ships could not chase us. Izzumi (Tōdō Takatora) got wounded in his arms." The immediate results of the battle were a shock to the Japanese command. Without being resupplied or reinforced, the morale of the Japanese soldiers declined. Joseon and Ming armies were able to regroup. Even after the victory, however, the Joseon navy was still outnumbered by the remaining Japanese navy, so Admiral Yi withdrew to the Yellow sea to resupply his fleet and have more space for mobile defense. After hearing the news of the heroic victory, many surviving ships and sailors who had been hiding after the defeat at Chilcheollyang joined Admiral Yi's fleet. The victory also enabled the Chinese navy to join Admiral Yi in early 1598. After the destruction of most of the Joseon fleet at Chilcheollyang, the Ming kept their navy stationed at important port cities to guard against possible Japanese naval attacks. 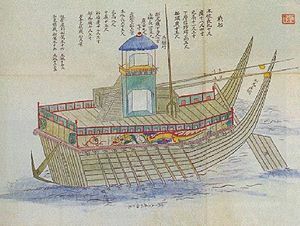 The victory at Myeongnyang convinced the Ming government that they could ease security at their major ports and deploy a fleet to the Joseon navy's aid. The Japanese navy was heavily damaged (while at least 30 of the Japanese fighting ships were destroyed,:314 the total number of damaged ships, to include those supporting ships that may have sustained damage, was not clearly reported). As previously mentioned, Kurushima was killed & beheaded, and Tōdō Takatora (the hero of Chilcheollyang) was wounded. According to the Annals of the Joseon Dynasty, half of the Japanese sailors and marines were casualties. Due to the Korean victory, after the Korean navy withdrew, even though the Japanese navy made an incursion into the western coast of Korea, near some islands of Yeonggwang County, they withdrew soon afterwards. There are claims that Yi had iron ropes tightened across the channel between Japanese fleet groups, which severely dampened the Japanese numerical advantage. However, in Yi's war diary no mention is made of such a tactic. The unique tidal conditions of the strait, which Admiral Yi was careful to study beforehand, affected the Japanese in several ways. The Japanese were competent sailors however, aware of and experienced in sailing in rough tides, as similar conditions existed in Japan. They counted on the rapid tides of the strait and their numerical advantages to break through the Korean line. This turned out to be a miscalculation. When attacking the Koreans, the Japanese did so in smaller groups. The Japanese could not advance all their ships into the channel at the same time; although the current was moving north, it was still unpredictable, with isolated eddies and whirlpools, and sending a mass of ships into the channel would cause them to collide with each other. Secondly, when the current reversed and flowed south at the end of three hours, the Japanese ships not only drifted away from the battle, but could not maneuver and ended up colliding with each other even if they avoided the eddy problems. This is probably the major reason why there were so many damaged Japanese ships. Lastly, the rough currents of Myeongnyang made it difficult for anybody who fell overboard or jumped from sinking or burning ships to swim to shore; most of the Japanese in the water ended up drowning. The primary sources for number of ships and men involved are from Yi Sun-sin and his nephew Yi Pun, in his biography on his famous uncle. In his war diary, Admiral Yi specifically mentions "at least 200 enemy ships" and "133 enemy warships." Yi Pun echoes these numbers and adds the detail that refugees viewing the battle from the hills above counted 333 Japanese ships then "stopped counting." It is unclear whether this is intended to suggest that the Japanese fleet was substantially larger than the 333 ships counted, or whether the refugees stopped counting because that was the size of the Japanese fleet and there were no more Japanese ships to count. An enlisted soldier, Chun, who had been captured by the Japanese forces and escaped, testified that there were 120 ships in the battle. For Korean numbers the most recent and accurate source is a letter from Yi Sun-sin to the Ming general Ma Gui where he stated, "I have 13 warships and 32 hyeopseon (협선)." Hyeopseon means "narrow ship" and was primarily used for scouting. It is speculated that these were ships given to Yi by local fisherman and not actively used in the battle. According to Tōdō, 13 Joseon ships were standing in the middle of the strait. According to Tōdō, half of his subordinate officers were killed or wounded during the battle. Also, a prisoner who had been captured by Japanese forces and escaped also testified that half of the Japanese soldiers were killed or wounded during the battle. British and American historians estimate more than 30 Japanese ships were destroyed. In short, half of the Japanese soldiers were killed or wounded while Yi suffered 5 total casualties aboard his flagship despite being outnumbered in warships by the Japanese by a ratio of at least 10 to 1. The Battle of Myeongnyang is portrayed in episodes 95 and 96 of the TV drama series Immortal Admiral Yi Sun-sin, and in the 2014 film The Admiral: Roaring Currents, both produced in South Korea. The final scene of the South Korean science fiction film Heaven's Soldiers takes place on the very onset of the battle. ^ a b c d e f g h i j k Hawley, Samuel (2005). The Imjin War: Japan's sixteenth-century invasion of Korea and attempt to conquer China. Berkeley: Institute of East Asian Studies, University of California. ISBN 9788995442425. ^ a b c d e f g h i "The official record of Todo Takatora, 高山公實錄, Tokyo University". Archived from the original on 2016-03-05. ^ a b c d e f g h i j k l m n o p q Yi, Sun-sin (ed by Sohn, Pow Key) 1977 "Nanjung Ilgi: War Diary of Admiral Yi Sun-Sin." Republic of Korea: Yonsei University Press. ^ a b "Tokyo university's Library". Archived from the original on 5 March 2016. ^ Lee Lee, Duksu. "亂中日記" (in Korean). ^ "Admiral Yi Sun-sin – A Korean Hero: The Battle of Myongnyang, A Maritime Miracle". Archived from the original on 2011-09-28. Retrieved 2010-08-17. ^ "船數則一百二十餘隻" (in Korean). Archived from the original on 2016-03-04. ^ "與統制使接戰, 倭賊爲半死傷" (in Korean). Archived from the original on 2016-03-04. Jang, Pyun-soon (1998), Noon-eu-ro Bo-nen Han-gook-yauk-sa 5: Gor-yeo Si-dae (눈으로 보는 한국역사 5: 고려시대), Park Doo-ui, Bae Keum-ram, Yi Sang-mi, Kim Ho-hyun, Kim Pyung-sook, et al., Joog-ang Gyo-yook-yaun-goo-won. 1998-10-30. Seoul, Korea. 桑田忠親 [Kuwata, Tadachika], ed., 舊參謀本部編纂, [Kyu Sanbo Honbu], 朝鮮の役 [Chousen no Eki]　(日本の戰史 [Nihon no Senshi] Vol. 5), 1965.